to Hyman is an Olympic volleyball player. ('harlene Calabre does interior design for boats. Hyman works out with her team as much as eight hours a day. Calabre heads for the local fitness center three to five times a week for a two-hour workout. A couple of years ago Hyman started using a computer as part of her training and her already phenomenal spiking ability became even more formidable. Calabre, the mother of two teenagers. began working out last August. She utilizes computerized testing apparatus to gauge her improvement, which has been impressive. A trained Olympic athlete and an interior decorator from New Jersey-you wouldn't expect them to have much in common, but both of them are using the most modern technology to achieve their personal best. Who would have dreamed there would come a time when we could all train just like the Olympians do? But, that time has come. Technology once reserved for the athletic elite is slowly seeping into the lives of recreational athletes as well. Sophisticated equipment like that developed at the Coto Research Center in Coto de Caza. California, is starting to pop up in health clubs across the country and in the near future will be available for Iioiii ii c.
members of the women's Olympic Volleyball Team practice; an Olympic shot putter trains on Ariel's machine. Below: A platform hooked up to a computer measures the forces generated during a sprinter's start-up. Top to bottom: A Coto Center staffer exercises while carefully watching the computer monitor: the graph on the screen displays the force of each up and down movement. an Olympic discus thrower practices the squat as a computer measures how much force he uses for each motion. Hyman and Calabre are both benefitii from equipment developed by Dr. Gideon Ar at the Coto Research Center. Hyman, aloe with many other gold medal hopefuls, has bet heeding the advice gathered from a compl computer process that begins with somethii called digitization. First, highly sensitive instruments tal pictures of the athletes and then transf them, frame by frame, to a computer scree There, the images, which appear as stick f ures, can be viewed from above, below, or an where in between. It is then possible to check the speed ar acceleration of each athlete, and graphs a produced to show the center of gravi throughout the movement. Stored data cE also be called up to compare an athlete's perfc mance with past achievements and even wit other athletes. 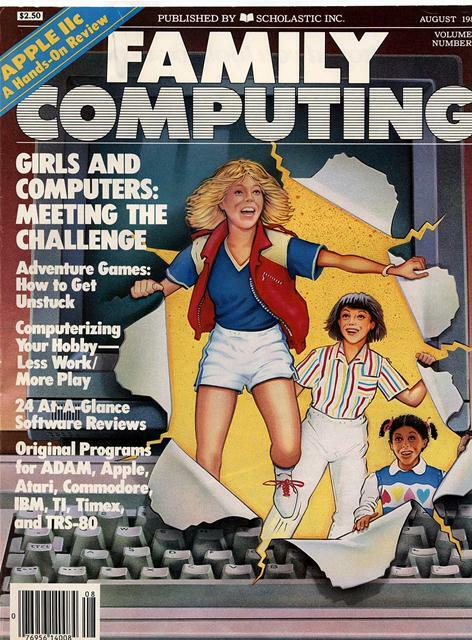 The women's Olympic Volleyball Team b gan integrating computers into their trainir in 1980, when they were barely taken serious as world-class contenders. In the past foi years the combination of natural talent ai technology has yielded the desired results. at the team is considered an excellent contend for the gold medal. Ariel and his team of researchers have al: designed a complete line of body-building app ratus which connects directly to microcompu ers, supplying continuous feedback to the atl letes during their workout, and analyzing tl range of motion for every knee jerk and muse flex they make. Meanwhile, Calabre and other members the LIFE (Laboratory of Isokinetic Fitness Exe vise) health club in Point Pleasant, New Jerse use computerized equipment to determir their muscle strength and endurance capabil ties, and to develop individualized fitness pr grams based on the results. The machine the use is named the Ariel, after its developer. LIF is one of a growing number of health clut offering computerized analysis and exercise techniques to people from all walks of life arr in all kinds of physical condition. According to the resident exercise physic ogist, Steve Soper. "We get all ranges of peop here, from serious young athletes to middy aged people who have been sedentary too ton and need a fitness program. and audio feedback." he added. "Besides the graphics display, the computer makes a beeping sound which intensifies in pitch in direct proportion to accelerated movements." Calabre echoed these sentiments. "It's a fantastic machine! It can give you a computer printout at exactly the moment you're doing something." she explained. "It tells you how much energy you're expending, evaluates your heart rate, and tells you which part of your body you're working the hardest." Soper added. "With the Ariel they [membersl get the added benefit of a very accurate day-to-day progress report on their power. endurance, strength, and cardiovascular ability." Each club member receives a personalized disk with a physical profile detailing items such as strengths. weaknesses, body build, and aerobic capacity. When the disk is inserted, the machine responds with directions for a highly efficient workout tailored to the individual's needs and desires-for example, losing weight, toning muscles, or building bulk. The computer prescribes the workout only after taking into consideration several variables gleaned from the member's daily personal profle. Based on this information. if the computer determines you're having a had day. it adjusts your regimen; if you feel in top form, it responds accordingly. Meanwhile, the color screen keeps you apprised of your results throughout your workout. In a short while, LIFE members will be able to use the complete Ariel exercise system. which will be installed in their club as well as in several others across the country. The machine. which resembles a component of the Nautilus weight system. hooks up to a microcomputer and allows participants to do all of their resistance and aerobic training with one piece of equipment. 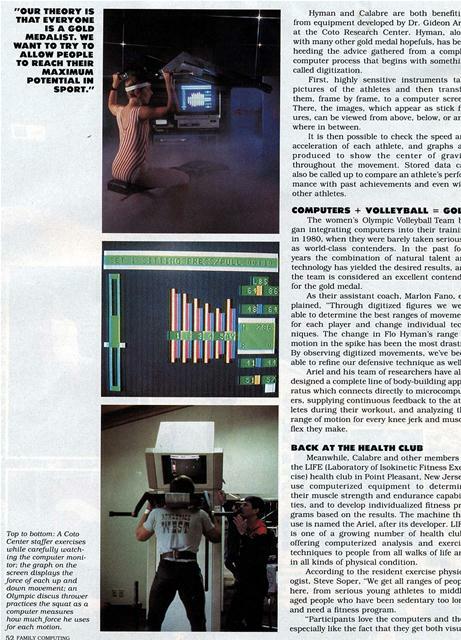 So, are computerized exercise regimens part of the 1984 vision we all feared-computers analyzing our every move and providing instantaneous feedback on everything we do? When we tune into the Olympics in the coming weeks, will we observe a band of highly mechanized, robotlike athletes making an emotionless bid for those precious medals? Such a grim picture is highly unlikely and certainly not the intent of the research scientists interested in bettering human athletic performances. Sandra Bauer, assistant to the director at the Olympic Training Center in Colorado Springs, believes the recent advances in sports medicine only support the human factor-they don't negate it. "Our purpose is not to create superathletes," she said. "We [the scientists) are just there to provide a microscope for the coaches and to get information to them faster." One example of the improvements scientists have brought to sports is recent advances in video equipment. Normal video operates at a speed of 60 frames per second. This is of very little value to a gymnastics coach who wants to accurately view a vault that takes a mere second and a half to execute-the relatively slow video produces a blurred image. However, thanks to technology, there are video cameras that can capture images at an incredible 200 frames per second. "Now coaches can really see what happened during a particular movement." Bauer explained. "They can then provide athletes with fast feedback on whether their leg was turned out or a toe was pointed incorrectly during a particular movement." And, according to Bauer. any hesitancy on the part of the coaches to utilize the computer data has long since vanished. "Initially, there was some fear that they [coaches[ would be eliminated. but now they understand that we only know the athlete mechanically. The coach is the only one who knows the athlete as a total human being-physically, emotionally, and psychologically." Coach Fano agrees with Bauer. "There's no reason not to use computers. Other countries are already starting to get interested in them, but for right now, it's given us quite an edge," he said. A monumental feat like winning an Olympic medal is often dependent on myriad forces coming together in exactly the right way at precisely the right moment. Just how big a part computers will play in the summer games remains to be seen, but along with the volleyball team there are other athletes with the computer edge that should be worth watching. One such person is Rick McKinney. Currently the No. I archer in the world, he is also the brains behind a program for testing the National Archery Team on a regular basis. Thanks to his efforts, since 1981 the country's top 20 archers have been sent to the Olympic Training Center in Colorado Springs each year to make training tapes utilizing biomechanical and physiological tests. Because movement patterns in this sport are crucial, reporting them accurately to the athletes is extremely beneficial. The intent is to translate such data into as many bull's-eyes as possible. 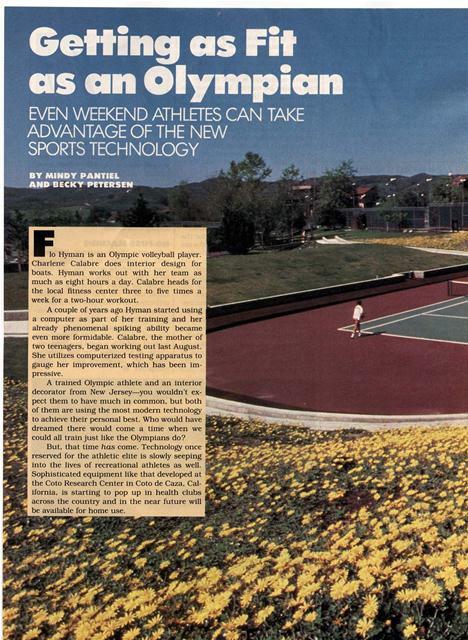 Another computer success story reads more like a fairy tale and involves discus thrower Al Oerter. Winner of four consecutive gold medals from 1956 to 1968. Oerter, at 47, is old enough to be the father of many of this year's Olympic participants. Despite his age. Ocrter wanted to stage a comeback and sought out Ariel's assistance in 1976. At the time, he was throwing well below his previous Olympic winning mark of 212 feet 6'/z inches. With the help of computerized analysis, he was soon throwing better than 221 feet, nearly 9 feet farther than in his prime. IF THE COMPUTER DETERMINES THAT YOU'RE HAVING A BAD DAY, IT ADJUSTS YOUR EXERCISE REGIMEN. Above: Four-time gold medal winner Al Oerter (right) studies a three-dimensional view of his discus throw. Inset: A stick figure representation of Oerter's movements. no human coach could, that Oerter was accelerating, then decelerating. then speeding up his motion again, when in fact, he needed to maintain a steady rate of acceleration throughout the movement. Oerter made the necessary changes and is a likely contender in Los Angeles despite his "old man" status. And, of course, there are others who may change the speed of an arm movement while executing a dive. or shift the angle of a foot on the balance beam based on a computer's advice. These athletes all hope the investment in technology will pay off in golden dividends. 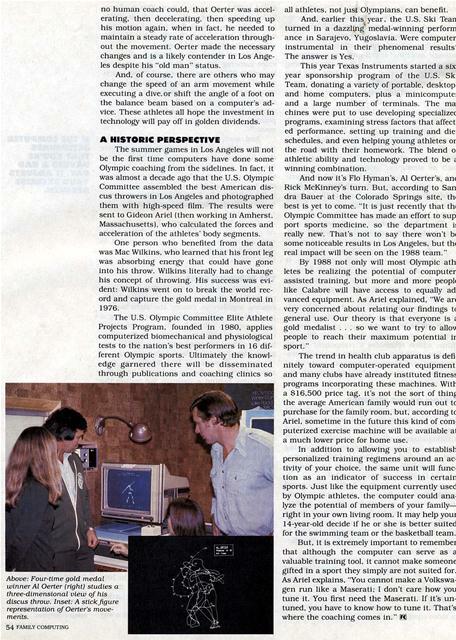 The summer games in Los Angeles will not be the first time computers have done sonic Olympic coaching from the sidelines. In fact, it was almost a decade ago that the U.S. Olympic Committee assembled the best American discus throwers in Los Angeles and photographed them with high-speed film. The results were sent to Gideon Ariel (then working in Amherst, Massachusetts). who calculated the forces and acceleration of the athletes' body segments. One person who benefited from the data was Mac Wilkins. who learned that his front leg was absorbing energy that could have gone into his throw. Wilkins literally had to change his concept of throwing. His success was evident: Wilkins went on to break the world record and capture the gold medal in Montreal in 1976. The U.S. Olympic Committee Elite Athlete Projects Program. 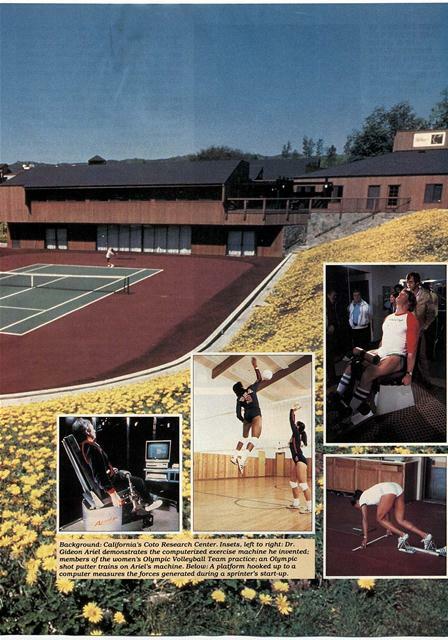 founded in 1980, applies computerized biomechanical and physiological tests to the nation's best performers in 16 different Olympic sports. Ultimately the knowledge garnered there will be disseminated through publications and coaching clinics so all athletes. not just Olympians. can benefit. And, earlier this year, the U.S. Ski Teanturned in a dazzling' medal-winning perform ance in Sarajevo, Yugoslavia. Were computer; instrumental in their phenomenal results` The answer is Yes. This year Texas Instruments started a sixyear sponsorship program of the U.S. Ski Team, donating a variety of portable, desktop. and home computers, plus a minicomputer and a large number of terminals. The machines were put to use developing specialized programs, examining stress factors that affected performance. setting up training and diet schedules, and even helping young athletes on the road with their homework. The blend of athletic ability and technology proved to be a winning combination. And now it's Flo Hyman's. Al Oerter's, anc Rick McKinney's turn. But, according to San dra Bauer at the Colorado Springs site. the best is yet to come. "It is just recently that the Olympic Committee has made an effort to support sports medicine, so the department iE really new. That's not to say there won't be some noticeable results in Los Angeles, but the real impact will be seen on the 1988 team." 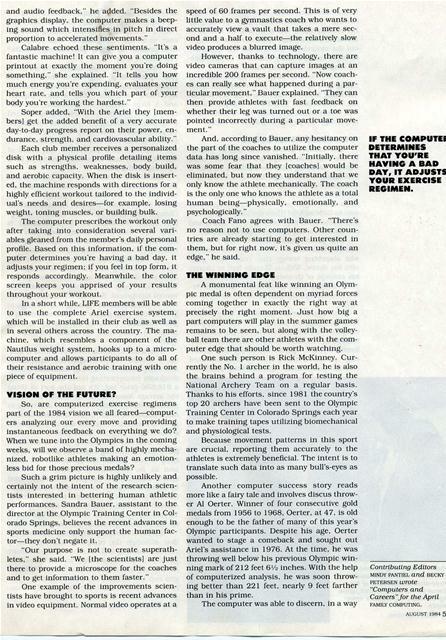 By 1988 not only will most Olympic ath letes be realizing the potential of computerassisted training, but more and more people like Calabre will have access to equally advanced equipment. As Ariel explained. "We arc very concerned about relating our findings tc: general use. Our theory is that everyone is a gold medalist ... so we want to try to allow people to reach their maximum potential in sport." The trend in health club apparatus is definitely toward computer-operated equipment, and many clubs have already instituted fitness programs incorporating these machines. With a $16.500 price tag, it's not the sort of thing the average American family would run out to purchase for the family room, but, according to Ariel, sometime in the future this kind of computerized exercise machine will be available at a much lower price for home use. In addition to allowing you to establish personalized training regimens around an activity of your choice, the same unit will function as an indicator of success in certain sports. Just like the equipment currently used by Olympic athletes, the computer could analyze the potential of members of your familyright in your own living room. It may help your 14-year-old decide if he or she is better suited for the swimming team or the basketball team. Generated on 4/20/2019 3:54:36 PM (PST) ADI/HQ/GBA/2019/ARIELCLOUD/v3.0.2018.0126.